Project diagrams are very useful for project implementation because they help teams visualize important details such as interrelations between tasks, critical paths, timelines, milestones, calendars, and also resource usage. Gantt chart — is one of the most convenient and popular types of graphical representation of task time. One of the most important resources for a project is a timely resource. Gantt chart's function is to show project tasks completed in progress and to make a project manager sure that project tasks were completed on time. We recommend using ConceptDraw PROJECT to organize and schedule tasks in a project tasks list. 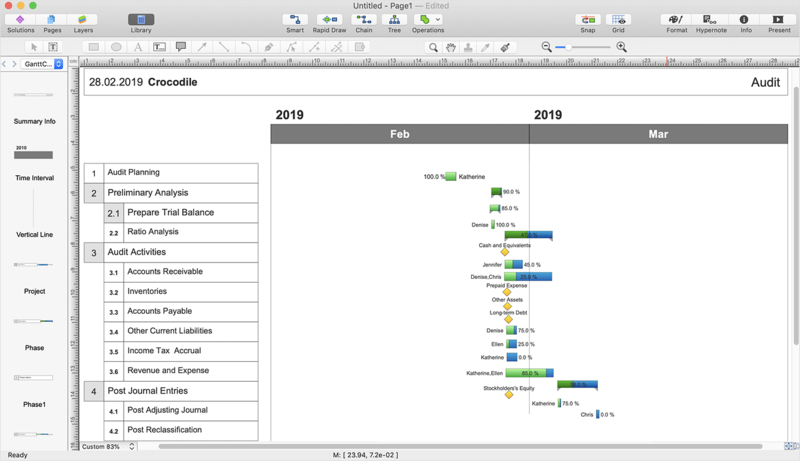 Then, using a ConceptDraw DIAGRAM you can quickly draw a full-screen Gantt chart diagram for your project tasks with an outline level equal to or less than two. Run ConceptDraw PROJECT file, and click the Project Diagrams button on the main toolbar. Select Gantt Chart from the list of Project Diagrams. A diagram will be generated from the project data and will be displayed in full-screen presentation mode of ConceptDraw DIAGRAM. Press Escape, to open it in ConceptDraw DIAGRAM document interface. Result: Use the Gantt diagram to represent your project completion in a progress, and to make sure that project tasks were completed on time.